Save 15% On My Cabin! Cabins USA is proud to offer some of the finest, privately owned Gatlinburg cabin rentals available. You can enjoy these nightly rentals with prime locations within walking distance of downtown or on secluded mountain ridges with scenic mountain views and natural settings. Below, you’ll find cabins with excellent amenities like hot tubs, fireplaces, home theaters, game rooms and soothing jetted tubs. With romantic 1-bedroom cabins and spacious mountain lodges, there are cabins to suit any sized group! With so many fun things to do in Gatlinburg, you’re bound to have an excellent stay! There are over 500 specialty shops and restaurants in downtown with everything from beautiful hand-carved crafts to delicious saltwater taffy. There are also exciting attractions like Ripley’s Aquarium of the Smokies and the Arts and Crafts Community in the Glades. Nearby Cherokee, NC is home to Harrah’s Casino and Pigeon Forge features Dollywood Theme Park. Last but not least, Gatlinburg is just outside of the Great Smoky Mountains National Park. So named for the natural fog and haze that envelopes its mountain peaks, the Smokies are a natural treasure filled with a diversity of plants, animals, and a rich cultural heritage. With of 520,000 acres to explore, Gatlinburg is a nature-lover’s paradise with hiking trails, waterfalls, and historic structures. To enjoy views of the mountains, go to the top of the Space Needle Observation Tower or take the Aerial Tramway to Ober Gatlinburg Ski Resort. Best of all, you can get a great deal on your cabin in Gatlinburg, TN! Book online with Cabins USA to save 15% on your Gatlinburg getaway! For visitors who want to stay in the heart of the Smoky Mountains, cabin rentals in Gatlinburg TN are an excellent choice. Not only can you stay near top-rated Pigeon Forge and Gatlinburg attractions, but these rentals are close to picturesque Downtown Gatlinburg as well! Renting one of our cabins in Gatlinburg, TN puts you in the middle of the action-packed Smoky Mountains. Whether you are looking to enjoy attractions in Pigeon Forge, shopping in Sevierville, or activities in Gatlinburg, these cabins are the ticket for Smoky Mountain fun. Certain Gatlinburg cabin rental resorts place you especially to area attractions such as Ober Ski Mountain, such as our Gatlinburg cabin rentals in Smoky Mountain Village. Additionally, these log cabins are nestled right next to the Great Smoky Mountains National Park. Every year, millions of visitors come to experience this unique treasure that preserves hundreds of miles of unspoiled nature and some of the most gorgeous scenery in the nation. Better yet, our cabin rentals in Gatlinburg, TN provides your own personal slice of Smoky Mountain beauty. Be sure to enjoy these amenities as part of your stay in Gatlinburg. For a more complete list of our available cabins, explore our Smoky Mountain cabin rentals by amenity page. Begin your Smoky Mountain vacation by booking one of our cabins in Gatlinburg. Though choosing one of the many Pigeon Forge cabins that are available is a great option, Gatlinburg cabin rentals are especially close to many beloved Smoky Mountain attractions. Of the many cabins you might choose, accommodations in this city are the closest rentals to the famous Great Smoky Mountains National park. Spend less time driving and more time experiencing everything that Gatlinburg and its gorgeous mountains have to offer from the comfort of one of Cabins USA's many Gatlinburg, TN cabin rentals. Looking to enjoy an affordable mountain getaway in the Smokies? Book this one bedroom cabin with game room, jacuzzi, and hot tub and enjoy a 15% discount! 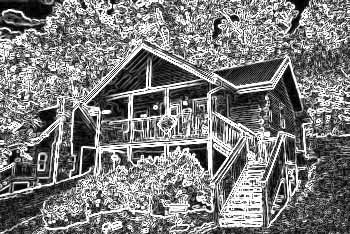 Mountain Shadows Resort, home to Gatlinburg Lovers Lane a honeymoon cabin rental with pool access. Book your Mountain Shadows Resort cabin online and SAVE! Want a Gatlinburg cabin with a view? Stay at "Angel's Landing" to enjoy incredible mountain scenery, a hot tub, a game room, and Cabins USA's 15% discount! Experience "Charming Charlie's Cabin," a luxurious 2 bedroom cabin rental in Gatlinburg with a hot tub, jacuzzi, and an impressive Smoky Mountain view! Enjoy this beautiful log cabin between Pigeon Forge and Gatlinburg on the Spur Road. "Beary Dashing" comes with 2-bedrooms, a gas fireplace, and room for 6 guests. Welcome to I Love View, a Gatlinburg cabin with theater room and phenomenal views! Discount when booking any of our cabins in the Glades Gatlinburg online. Welcome to Queen Margaret, a vacation home near Pigeon Forge with spectacular Smoky Mountain views! Online Discount. Welcome to "Reclusive Moose," an affordable, 2-bedroom cabin on Gatlinburg's East Parkway. Book your cabin today to save 15% with Cabins USA's discount! You'll find this affordable cabin in the beautiful Cobbly Nob Resort area of Gatlinburg with pool access, a hot tub, foosball, and a special cabin discount! Experience a premium cabin vacation in the Smokies when you stay at "A Grand Getaway" in Black Bear Falls Resort. Book online and save 15% on your lodging! Enjoy a Smoky Mountain vacation in a beautiful resort area in a luxury log cabin complete with a pool table, indoor pool, hot tub, and mountain views. Have a fantastic vacation when you stay at "Gatlinburg Views!" This luxury 3-bedroom cabin comes with pool access, a theater room, game room, and a hot tub! Welcome to "View Topia Falls," a luxury cabin in the Smokies with an indoor pool, hot tub, game room, and premium mountain view you won't soon forget! Your Gatlinburg chalet rental with views of downtown Gatlinburg and the surrounding Smoky Mountains area. Located in Smoky Mountain Village Resort. Escape to the rolling green hills of the Smokies at “Emerald View”. This 3-bedroom cabin near Pigeon Forge with game room, mountain views, and more! "Gray Fox Den" is a beautiful 3 bedroom Gatlinburg cabin with resort pool access, a theater room, hot tub, and a 15% discount on its nightly rate! Start your vacation by booking "Moonshine Inn" in the Great Smoky Mountains! Save 15% on your nightly rate for this 3-bedroom cabin by booking with Cabins USA! Stay close to Ober Ski Mountain with "Skiing With The Bears!" This comfortable 3-bedroom cabin sleeps 8 guests and boasts luxury amenities. Book today and save! Enjoy a vacation with luxurious accommodations at “Hearthstone.” This condo for rent near Pigeon Forge places guests within walking distance of top attractions and offers a comfortable interior. Stay close to Gatlinburg and Ober Ski Mountain when you book "Bear Crossing," a lovely Chalet Village Resort cabin with pool access, a pool table, and hot tub. Welcome to "La Dolce Vita," a lovely 4 bedroom cabin in Gatlinburg with a pool table, hot tub, deck, and unique stone décor. Book this cabin today & save 15%! Experience Mistletoe Lodge in Gatlinburg, TN! This 4-bedroom cabin rental near the Smoky Mountain Arts & Crafts Community is the perfect place to getaway. Book a premium Chalet Village Resort cabin complete with a fantastic view, a theater room, premium amenities. Book online & save on your 5-bedroom rental! Stay at "A View From Above" to enjoy a luxury Gatlinburg cabin with excellent mountain views, a theater room, game room, pool access, and a 15% discount! Come experience this cabin with an incredible mountain view, a hot tub, theater room, game room, and resort pool access in Gatlinburg, TN! Experience "Elkhorn Lodge" in the Smoky Mountains! This truly luxurious 5-bedroom cabin has room for up to 14 guests and a prime location near Gatlinburg! Enjoy scenic views of the Smoky Mountains from your group cabin with mountain views near Pigeon Forge that sleeps 16. Need a pet friendly cabin in Gatlinburg with 5 bedrooms? "Hearts Desire" boasts a great location, a hot tub, game room, and a 15% discount rate! Searching for a luxury cabin in the Smokies for your group? "Royal Vista" is a beautiful 6-bedroom cabin rental with mountain views and room for 20 guests! Looking for a comfortable Smoky Mountain group cabin for up to 22 guests? "Grand Pinnacle" has 6 bedrooms and is near Pigeon Forge and Ober. Experience a luxury cabin with a gorgeous mountain view, a indoor pool, theater room, game room and more! Book online with Cabins USA in Pigeon Forge today!